You may or may not be familiar with the regular version of Stay Don't Stray by Benefit. If you are, you'll know that there were some major improvements in the packaging department — namely the handy doe foot applicator, instead of a pump that dispensed too much product at a time. But I was mostly intrigued with the release of a Medium/Deep version of this primer, which means no more ashy shadows in sight, especially if you have (really) dark circles. Let me be clear about this. The Medium/Deep shade isn't quite as dark as it sounds. Considering that this isn't just a primer for the lid area, but also primes the under eye area before concealer application, this shade should be defined as "Medium". And perhaps a release of a darker tone, that would be named "Deep". But let's not get greedy, my friend! Now, here's the lowdown. 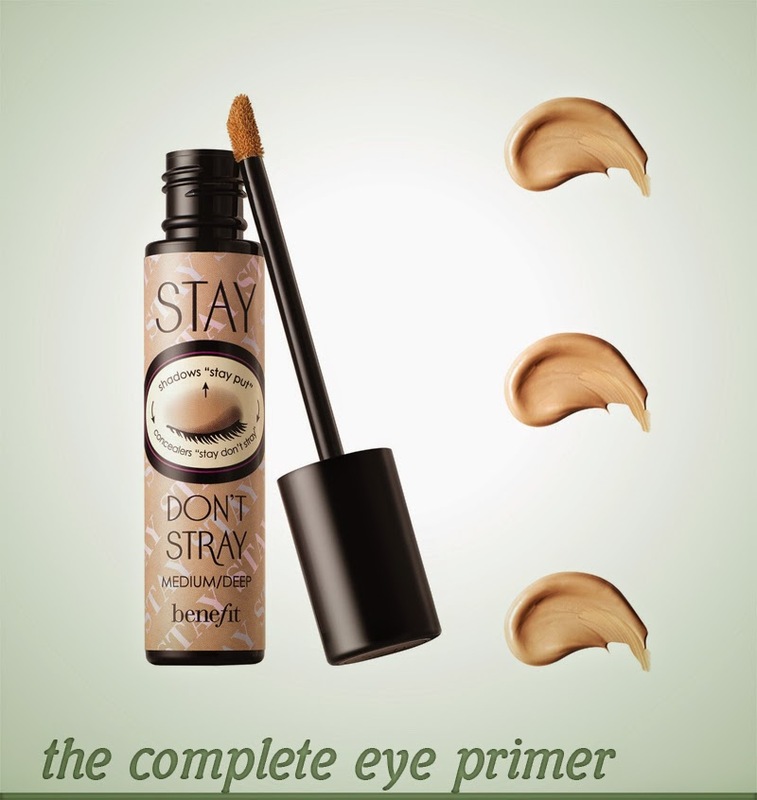 I have to say, this is the best eye primer I've tried so far. Let's consider the skin in a 360º mode: oily lids, dry skin under the eyes and the occasional bit of eczema in the inner corners. This doesn't cling onto dry patches, like some primers do — especially tinted ones — and has an amazing staying power on the lids. Quite impressive, really. Plus, it neutralizes the lid colour, making it ideal to wear on it's own, or to make eyeshadows pop. What really sold me, was the fact that because it's tinted, you need a lesser amount of concealer — which, together with the priming action, means less creasing. I rarely set it with powder anymore. And I could (and have) totally rock this on it's own, for a no make-up day. Besides lasting quite well throughout the day, it also doesn't dry out on the skin, due to the sodium hyaluronate in the formula. I find that the best way to apply this product is with light tapping motions, using your ring finger (as per usual). Start on the under eye area and apply the remaining product onto the lids — this is the part where I say "a little bit goes a long way". You can immediately notice the brightening effect upon application. Definitely a keeper!